Blockchain is undeniably the most meritorious of technologies we have access to at the moment. The superfluous technology is literally revolutionizing every sector only to bring in the best benefits for the same. Blockchain holds common good for different sectors with its decentralized and transparent nature. However, it is also part and parcel of practicality that these features of Blockchain are too common that they actually turn into loop holes of vulnerability. This is precisely where a Quorum Blockchain Development Company comes into context to build permissioned Blockchain networks with an extra layer of security. Hire Quorum Blockchain Developer from SHAMLA TECH to create robust private Blockchain networks in order to provide choosy access to the confidential data you hold. In simple terms, Quorum is an enterprise-focused Ethereum blockchain. It comes to advocate a better infrastructure for the finance sector in particular by way of limiting the number of participants who gain access to the information under concern. The private Blockchain is the brainchild of J.P.Morgan and is characterized by high-speed performance and processing while extending supreme privacy on the other hand. It works seamlessly in a permissioned group where the participants are quite familiar with each other. In a nutshell, Quorum is the one-stop blockchain solution that caters to the explicit needs of the finance sector at large. Henceforth, Quorum Blockchain plays a vital part in setting new standards in the banking and insurance systems. Ultimately, it is mandatory to Hire Quorum Blockchain Developer to take professional assistance when it comes to Quorum Blockchain Development. Quorum Blockchain comes with a remarkable speed and can carry out hundreds of transactions every second. The transaction speed usually relies on smart contract configuration and network configuration. With timely optimization, the transaction speed shall be accelerated. Quorum also makes use of QuorumChain RAFT consensus algorithm to ensure performance enhancement. Privacy is one of the key aspects of any Blockchain solution and Quorum blockchain has fullest expertise at it. Quorum provides transaction-level privacy and network-wide transparency simultaneously. The parameters are under the control of the respective businesses and are subject to personalization. The smart contract plays an optimal role in the customization of privacy and transparency level. As Ethereum forms the base of Quorum, the latter naturally inherits the key properties of the former. In short, Quorum is a mature version of Ethereum. It opens doors for a more stable and more reliable financial ecosystem. It has a good market scope with its matchless capacity to handle numerous nodes of finance efficiently. 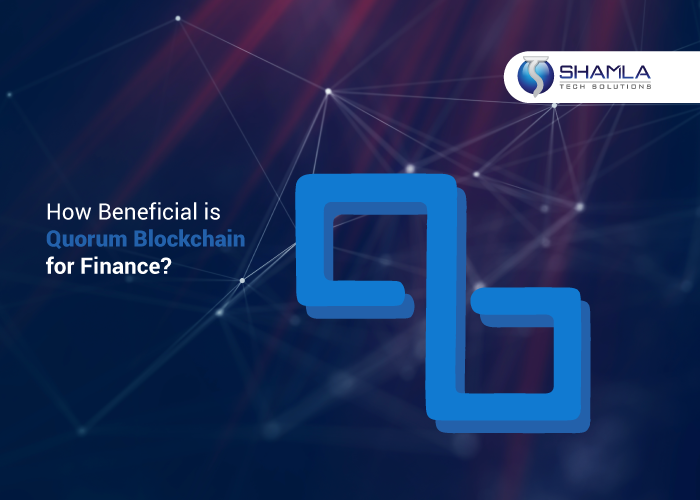 As a professional Blockchain Development Company, SHAMLA TECH extends creative edge Quorum blockchain solutions with a team of enthusiastic Blockchain professionals. Our progressive enterprise-grade blockchain deliverables are formulated with the ultimate aim to fetch futuristic success for our clients. Hire Quorum Blockchain Developer and Programmer from SHAMLA TECH now to avail world-class Quorum Blockchain Development services at attractive prices.